Zach and James were pretty set on their Halloween costumes this year. James insisted on being the red power ranger and Zach wanted to be the red ninja turtle. I didn’t post the photos on Facebook because I started drinking and forgot to take photos of my children. Luckily I have a new friend who saved me. These are her twins in the photo as a Texan and a Skylander. 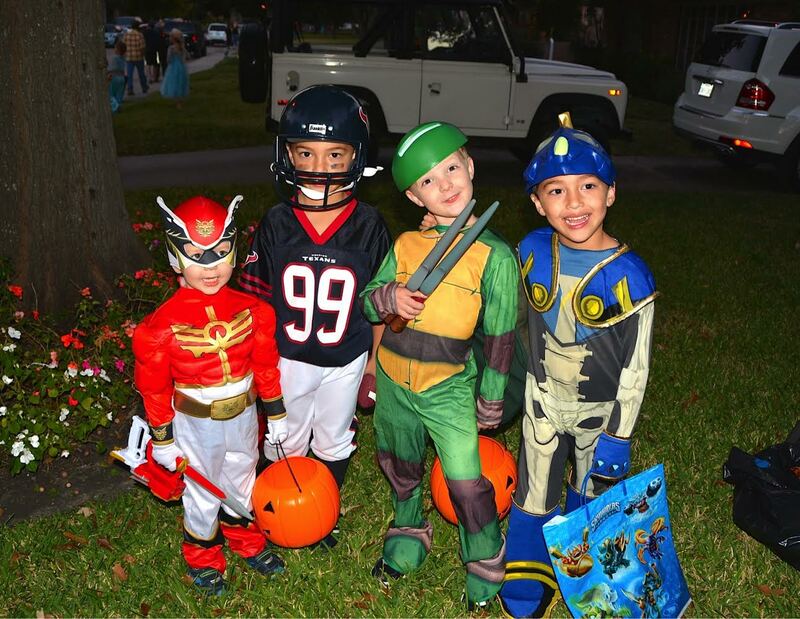 We hit two Halloween parties (because we like to challenge ourselves) which only served to pump the boys up even more for the trick or treating. At the second one we tried to force a piece of pizza in their faces, but I think I was the only one who ate. As soon as it was dusk, it was on. You guys, it was all Lord of the Flies in our ‘hood. Zach, the twins and some other boys were sprinting house to house up and down the street. People were everywhere and some streets were closed to cars. Parents were pulling wagons for little kids or coolers, or both in our case. We kept running into kids from both the boys schools and other random friends. It was like one long block party. I legitimately lost Zach for about 10 minutes. Lost. No clue where he was. We were on my street, but a block down. We all know that I am not a hoverer, but even I was getting slightly concerned. Luckily he was still with the gang of boys. They had stopped for a candy break in an open lawn. I am sure the neighbors were thrilled. James and the twin’s little sister were slower on the take. James kept falling down in his costume (I don’t think he could see) then rolling around the yards just for fun. Finally he got the idea and he too started running house to house. I put Alex on him as clearly I am not fit to be in charge in the dark. When we decided to head back home, we ran into one of Zach’s classmates and his dad. 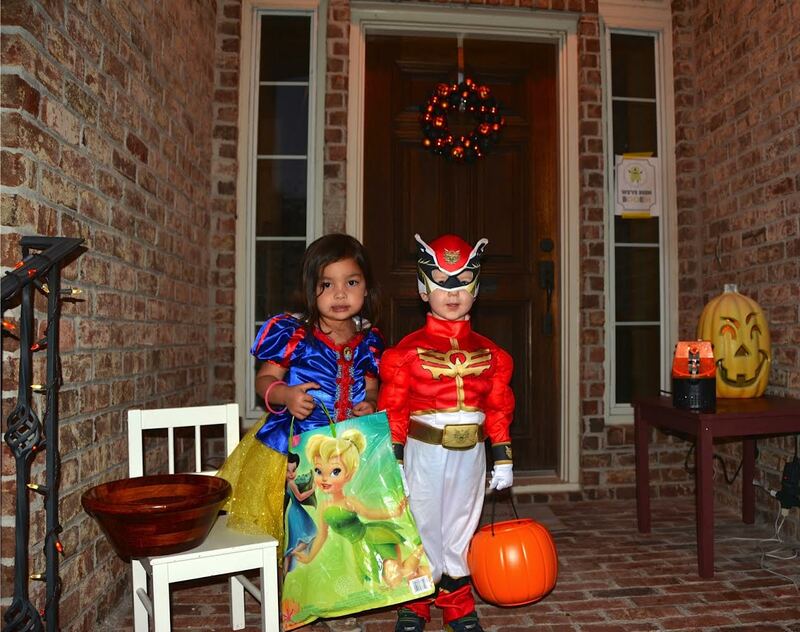 We convinced him (with an alcoholic beverage) to trick or treat down to our house. 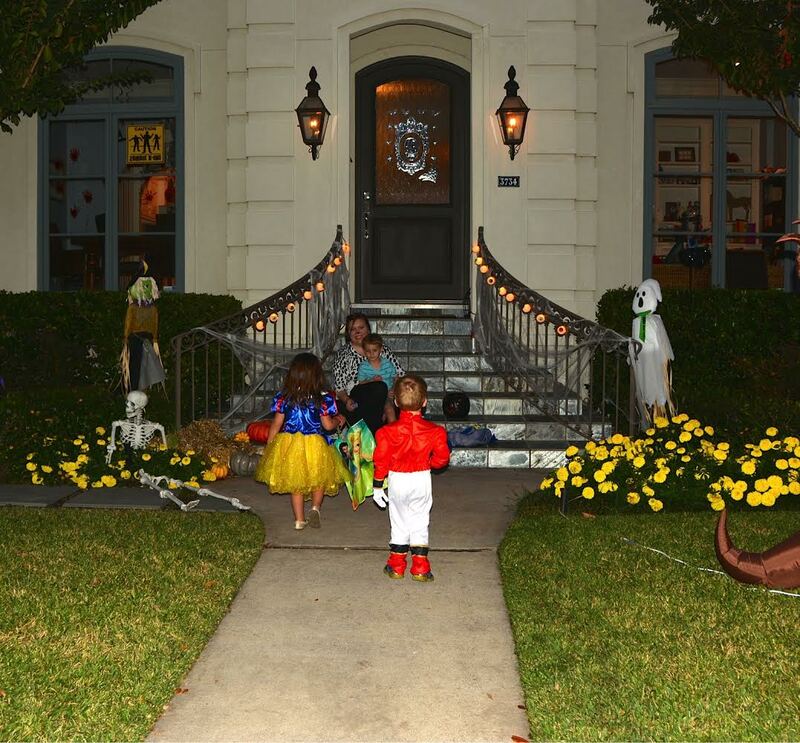 The boys were so cute handing out candy, including some from their own bags. They sat out on the front stairs and forced everyone walking by to take some. Goal for next year – arm Zach with something to call me with when I lose him. Good thing he knows my number.